Chalk Markers (Pack of 12) - ONLY $10.99 After Code! Chalk Markers (Pack of 12) – ONLY $10.99 After Code! 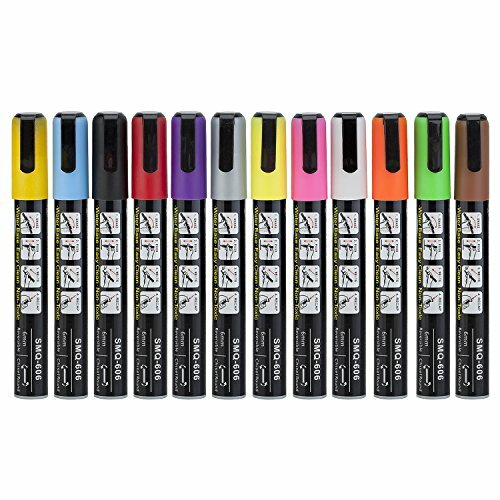 Chalk Markers,Medium Point, Paint Markers Pen, Chalk Board Marker Paint Pen On Any Surface – Canvas, Glass, Ceramic, Rubber,Plastic, Paper, Leather (Pack of 12) – Only $10.99 After Code! Score a GREAT DEAL on the Chalk Markers,Medium Point, Paint Markers Pen, Chalk Board Marker Paint Pen On Any Surface – Canvas, Glass, Ceramic, Rubber,Plastic, Paper, Leather (Pack of 12) today for only $10.99 AFTER YOU USE THE CODE ZPCJFPU4 from Amazon! You will get FREE Shipping if you are a Prime member! If you are not an Amazon Prime member you can grab a FREE 30-Day Trial HERE! Get the all the Details of this deal below! REMEMBER TO USE THE CODE ZPCJFPU4 TO GET THE SAVINGS! 【SUPER MULTI-PURPOSED】:Great for Restaurant Menu Boards, Bistro Boards, White board, Window or Mirror markers, Car Windows, Kids art, School work, Marking dates on food Containers, Ceramic Mugs, Chalkboard contact paper, Chalkboard Labels, Thank you stickers, Wall Decals ect. 【VARIOUS COLORS TO CHOOSE】:Gold, Silver, Black, White, Red, Yellow, Blue, Green, Violet, Pink, Orange, Brown. Pack of 12pcs, you can chose any color you like. 【EASY CLEAN】:chalk markers pen is bright, beautiful liquid chalk Ink in each ChalkTastic is completely dust-free and makes cleanup a breeze for these erasable chalk pens.Just use a dry or damp cloth to wipe the chalk away, without any smearing, streaking, smudging or messes! 【CERTIFIED NO-TOXIC 】:we promise a non-toxic,eco-friendly product for adult,kids and everyone. tested & Certified by ISO(International Standard Organization) and ASTM(American Society for Testing and Materials). 【NOTICE】:Keep away from direct sunlight.Shake vigorously before use.Put the cap on immediately after use. ABOUT US:Thank for your support very much firstly, if you have any question, pls contact to us ,we will do our best help you solve it. 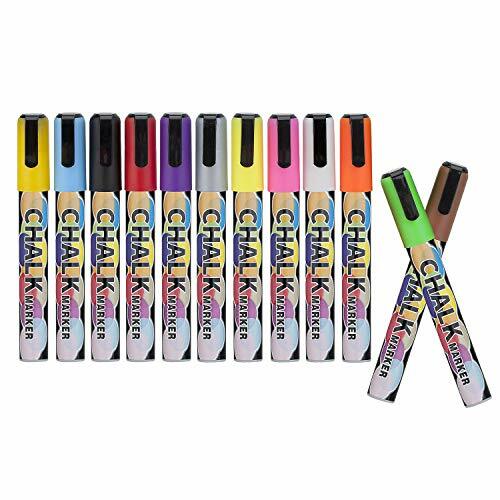 Chalk Marker Colors:Gold, Silver, Black, White, Red, Yellow, Blue, Green, Violet, Pink, Orange, Brown. Pen Dimensions: 1.6cm x 14cm. Package including:12 pcs chalk markers. How to use it: 1.Press the tip with finger to release pressure. 2.Shake vigorously-the ball inside will rattle up and down. 3.Press a piece of paper repeatedly until the ink fills the nib. 4.Can test writing on paper. 5.Cover it immediately after use to avoid sunlight. Don’t miss this deal at Amazon Today on the Chalk Markers,Medium Point, Paint Markers Pen, Chalk Board Marker Paint Pen On Any Surface – Canvas, Glass, Ceramic, Rubber,Plastic, Paper, Leather (Pack of 12) for only $10.99 AFTER YOU USE THE CODE ZPCJFPU4!